August 10, 2016 TAEBA's Bertin quoted in S&P Platts: "Texas utility rate proposal draws fire, praise"
May 20, 2016 TAEBA in San Antonio Business Journal: "'Advanced energy’ jobs outnumber refining"
PUCT upholds long-standing policy that averages electricity system pricing equally across state. Also today, the commission opened up a proceeding to evaluate how to prepare for the growing electric vehicle market, which TAEBA supports. Today, the Texas Advanced Energy Business Alliance applauded the Public Utility Commission of Texas (PUCT) for deciding to uphold a long-standing policy that averages electricity system transmission losses, sharing costs equally among energy generators, throughout the state. The current policy has allowed consumers in population centers such as Houston and the DFW metroplex to access lower cost wind and solar energy produced in rural West Texas. Reversing this policy, as proposed by NRG and Calpine, would have raised costs to consumers. “We Texans are lucky to have been blessed with abundant natural resources. Besides the oil and natural gas resources that have deeply influenced our global energy economy for more than a century, Texas also has been blessed with some of the best wind and solar potential as compared to elsewhere in the country, and we should take advantage of the opportunities that these resources bring to the state to continue our leadership in energy,” said Suzanne Bertin, executive director of Texas Advanced Energy Business Alliance. As of 2018, Texas was number one in installed wind capacity, with more than 22.5 gigawatts (GW) of installed capacity – more than three times greater than the number two state, according to data from the Electricity Markets Policy Group at Berkeley Lab. Texas also ranks fifth in the nation in installed solar capacity, with more than 2.6 GW already installed, as reported by the Solar Energy Industries Association, and more than 31 GW that have requested interconnection, according to ERCOT’s Sept. GIS Report. Of the more than 233,000 advanced energy jobs in Texas, a quarter of those are in advanced electricity generation and the grid technologies that integrate with generation to make the system more efficient and reliable. Large businesses increasingly seek wind, solar and other advanced energy resources to meet their energy needs, driven by opportunities for cost savings and cost certainty, and a desire to meet the expectations of their investors, employees, customers, and other key stakeholders with respect to sustainability. As of March 2018, Texas projects accounted for a full 27% of all corporate renewable energy contracts — with more than double the number of projects as the next leading state, according to Rocky Mountain Institute (RMI). Since 2013, customers have voluntarily purchased over 13 GW of offsite renewable energy across the country. Over the past five years, annual purchases have increased by over 1000%, from just 0.32 GW in 2013 to 3.86 GW to date in 2018, per RMI data. Additionally today, the PUCT announced its decision to open up a new proceeding to evaluate how to prepare for the growing electric vehicle market, including planning for distribution system needs. The PUCT noted this was in anticipation of a number of related issues that may need to be addressed by the legislature in 2021. The Texas Advanced Energy Business Alliance (TAEBA) includes local and national advanced energy companies seeking to make Texas’s energy system secure, clean, reliable, and affordable. In Texas, the advanced energy industry produces more than $16 billion in annual revenue and employs more than 233,000 Texans. TAEBA’s mission is to raise awareness among policymakers and the general public about the opportunity offered by all forms of advanced energy for cost savings, electric system reliability and resilience, and economic growth in the state of Texas. Learn more at texasadvancedenergy.org and follow our latest news @TXAdvEnergyBiz. AUSTIN, September 25, 2018 — Today, business group Texas Advanced Energy Business Alliance (TAEBA) released a fact sheet showing that Texas has 233,000 people working in advanced energy. This represents more workers than those in Mining, Oil & Gas (231,364), and about double those working at Auto Dealers (118,353) across the Lone Star state. The U.S. employs a total 3.4 million people in advanced energy jobs across the nation. Energy Efficiency led all advanced energy segments, with 154,600 jobs. Advanced Electricity Generation, including wind, natural gas, and solar, supports 44,200 jobs. Strong 7% jobs growth expected this year by employers. 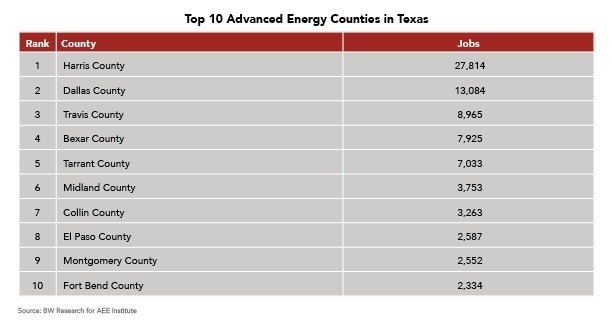 Top 5 counties are: Harris (57,500), Dallas (35,200), Travis (17,700), Tarrant (15,500) and Bexar (15,300), with all 254 Texas counties employing advanced energy workers. TAEBA members have engaged with policymakers on ways to reduce market barriers in the state’s competitive energy market to ensure advanced energy technologies contribute to the power system. “Texas advanced energy contributes to our strong competitive energy market model, and we should ensure that non-traditional technologies are allowed to compete to strengthen our grid and electricity system, while reducing costs,” added Bertin. The employment figures were derived from analysis by AEE and BW Research Partnership of data from the 2018 U.S. Energy and Employment Report published by the National Association of State Energy Officials (NASEO) and the Energy Futures Initiative (EFI) earlier this year, as well as data from the Bureau of Labor Statistics. The Texas Advanced Energy Business Alliance (TAEBA) includes local and national advanced energy companies seeking to make Texas’s energy system secure, clean, reliable, and affordable. TAEBA’s mission is to raise awareness among policymakers and the general public about the opportunity offered by all forms of advanced energy for cost savings, electric system reliability and resiliency, and economic growth in the state of Texas. Learn more at texasadvancedenergy.org and follow our latest news @TXAdvEnergyBiz. Today, the Public Utility Commission of Texas (PUCT) approved recommended improvements to streamline the Smart Meter Texas (SMT) portal* at the Commission’s Open Meeting. A diverse group of stakeholders, including Mission:data Coalition, Texas Advanced Energy Business Alliance (TAEBA) and EnerNOC, filed a unanimous settlement agreement* with the PUCT on Jan. 29 detailing SMT improvements. Implementation of the approved changes will make it easier for customers in competitive electricity areas of Texas to choose energy management providers for services such as energy efficiency, demand response, distributed generation, and other energy software products and services. Under the settlement agreement, these “competitive service providers” (CSPs) are not considered retail electric providers — which get more revenue when customers use more electricity — but rather are companies that specialize in providing services to help customers better manage how much energy they use, when they use it, and how much they spend on their monthly bills. Historically, Texas has been at the vanguard of electricity competition and was one of the first states to deploy advanced meters in 2008, with the Smart Meter Texas portal being a feature unique to Texas. The SMT portal provides a way for customers to download and view their own energy data or share it with companies that can help interpret the data and suggest actions to save money. As originally designed, the SMT portal has been difficult for customers to use, resulting in very few taking advantage of the system. The improved SMT access resulting from this settlement agreement will allow customers to opt-in to data sharing with their chosen competitive providers with a simple and secure one-click email consent. With this decision, Texas will be updating the Smart Meter Texas portal to be more in line with national standards such as Green Button, which provides a standardized data format for software developers to develop application programming interfaces (APIs) with the system. Standardization will promote new business development in the state as advanced energy companies offer new products and services to help customers manage their energy use. "We've seen that customers are discouraged from enrolling in programs with unnecessarily time-intensive, complex, and complicated steps,” said Laura Kier, Senior Associate, Market Operations, at EnergyHub, a residential demand response and grid services provider. “This more streamlined process for Smart Meter Texas is crucial to creating a positive customer experience, and one that encourages customers take advantage of new energy services." *Note: SMT docket and documents can be accessed via AEE’s PowerSuite tool via trial access. Credentialed media may contact mhanis@texasadvanedenergy.org, for permanent complimentary access. TAEBA Policy Priority: Empowering Customers with Energy Data is here. Access to Data: Bringing the Electricity Grid into the Information Age, an AEE issue brief is here. Austin, Texas – May 10, 2016 – Employment in Texas’s advanced energy industry stands at an estimated 143,023 workers. That’s more people than are employed in chemical manufacturing and petroleum refining, twice as many as employed by airlines, and nearly as many working in building construction in the Lone Star State. Employers engaged in advanced energy business expect to increase their workforce by 7 percent this year, which would bring Texas’s advanced energy industry to over 152,000 jobs. 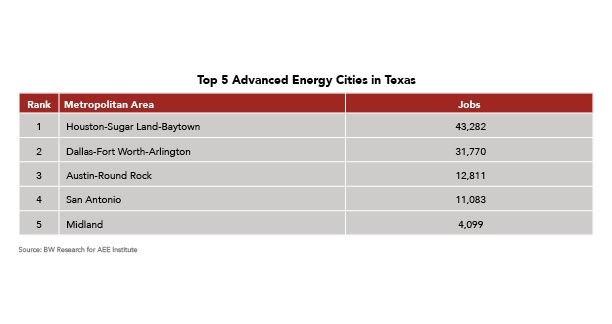 These are some of the findings of Advanced Energy Jobs in Texas, a new report released today by the Texas Advanced Energy Business Alliance (TAEBA). A new Energy Employment Index, produced by BW Research Partnership, makes it possible to quantify jobs in the advanced energy industry for the first time. The Index is based on data from the Bureau of Labor Statistics and a detailed survey of more than 20,000 businesses nationwide conducted between September and November of 2015. The Index is the basis for the U.S. Dept. of Energy’s first annual U.S. Energy and Employment Report, which was published in March. For TAEBA, BW Research Partnership was able to draw on the Index, which covers employment in the entire energy industry, to quantify the jobs directly associated with advanced energy in the state of Texas. In this report, advanced energy employees are defined as full-time and part-time permanent employees of businesses that are engaged in making or deploying advanced energy products and services for all or a portion of their revenue, and who themselves support the advanced energy portion of these businesses. Advanced energy workers are those who spend some or all of their time on advanced energy work such as energy efficiency, advanced electricity generation (including wind, solar, and natural gas), biofuels, advanced grid technology, and advanced vehicles. The report also illustrates the variety of jobs with eight profiles of Texas advanced energy workers. The TAEBA jobs report follows Advanced Energy in Texas, published last year, a market report that found advanced energy represented a $16 billion industry in Texas. Advanced energy employed an estimated 143,023 Texans in 2015. Workers engaged in advanced energy make up 1 percent of the state workforce overall. Employers surveyed expect to add an estimated 9,334 new jobs this year, an increase of almost 7 percent, which would bring advanced energy employment to over 152,000. The largest share of advanced energy jobs is in energy efficiency – 51 percent, or about 73,000 workers. At nearly 39,000 workers, employment in Texas advanced electricity generation, makes up 27 percent of the advanced energy workforce. Wind accounts for about 44 percent of these jobs, solar 28 percent, and advanced natural gas 16 percent. Texas is also home to a significant advanced fuels industry, with an estimated 9,500 workers in total, the majority of whom work on corn ethanol. Advanced Transportation employs 19,000 workers (13 percent of total advanced energy employment) who spend some or all of their time on hybrid, plug-in hybrid, and natural gas vehicles. Texas’s advanced energy workforce is predominantly male (78 percent); 43 percent of advanced energy workers in Texas are racial or ethnic minorities, with the share of last year’s hires significantly higher (53 percent). Texas has nearly 15,000 companies engaged in advanced energy as part or all of their business activity. Texas advanced energy industry is primarily composed of small businesses. Three-quarters of advanced energy businesses employ 24 permanent employees or less. But Texas has a sizeable share of medium-sized firms as well – 15 percent of advanced energy businesses employ between 25 and 249 workers, indicating the advanced energy economy is mature enough to support larger firms. The Texas Advanced Energy Business Alliance includes local and national advanced energy companies seeking to make Texas’s energy system secure, clean, reliable, and affordable. TAEBA’s mission is to raise awareness among policymakers and the general public about the opportunity offered by all forms of advanced energy for cost savings, electric system reliability and resiliency, and economic growth in the state of Texas. For more information, visit texasadvancedenergy.org. Austin, Texas – Feb. 4, 2016 – Today, the Texas Advanced Energy Business Alliance (TAEBA) announced the appointment of Suzanne Bertin, a seasoned Texas energy business and regulatory expert, to lead the business group as its Executive Director. TAEBA members include local and national companies that represent the vibrant and growing advanced energy industry in Texas. According to an analysis by Navigant Research published last March, Texas advanced energy revenue reached $16 billion in 2014, representing 8 percent of the total U.S. market for advanced energy technologies and products – enough to buy the Dallas Cowboys, the NFL’s most valuable franchise, five times over. "The Texas Advanced Energy Business Alliance is lucky to have found Suzanne Bertin to lead a broad range of stakeholders that see great opportunity for industry growth and impact in our state," said John Ashe, Director, CLEAResult, a leader in designing and implementing technology-enabled energy efficiency programs for utilities, headquartered in Austin. "Texas has the pro-business, pro-growth spirit to make the most of this opportunity to lead in energy innovation, service options and savings for energy clients in Texas and beyond." "We are thrilled to have Suzanne Bertin leading our efforts to build a strong industry presence in Texas," said Todd Horsman, Vice President, Regulatory and Delivery for Landis + Gyr, a global leader in energy management solutions, including electricity metering and smart grid services. "New technologies and business models are fundamentally changing the way we make, manage, and use energy - we could not have found a better leader to ensure Texas gets its fair share of this high-growth market, along with the investment and jobs that come with it." "The Texas solar market is booming and, with Suzanne Bertin on board, TAEBA is positioned to help us accelerate this growth, along with all advanced energy technologies," said Colin Meehan, Director, Regulatory & Public Affairs, First Solar (NASDAQ: FSLR), the largest U.S. based manufacturer of photovoltaic (PV) panels, with several major projects in Texas. "As our member companies grow, so does the Texas economy, creating jobs and contributing toward prosperity for all Texans." Prior to joining TAEBA, Bertin handled regulatory and government affairs in Texas and the Southeast for EnerNOC, a leading provider of cloud-based energy intelligence software and services to thousands of enterprise customers and utilities globally. In that role, she was an active member of TAEBA and worked with other companies to launch the organization. Before EnerNOC, Bertin was at Reliant (NRG) for more than a decade, where she worked on a wide range of wholesale and retail legislative and regulatory issues, from the inception of the competitive retail market in ERCOT. In these roles, she had direct business and policy experience relating to advanced energy technologies including energy efficiency, demand response, natural gas, solar, wind, electric vehicles, and smart grid. Bertin worked in the Office of Policy Development at the Public Utility Commission of Texas during the late 1990s, when the ERCOT competitive retail market was established by Texas Senate Bill 7. Suzanne co-led the team responsible for implementing the transition to competition, which encompassed more than 40 regulatory proceedings, many of which were highly complex and contentious. She previously held electrical engineering positions at Austin Energy and at NASA’s Johnson Space Center. Bertin earned her Master of Public Affairs degree from the LBJ School of Public Affairs at the University of Texas at Austin. She also holds a Bachelor of Science in Electrical Engineering and a Bachelor of Arts (Managerial Studies), both from Rice University in Houston, Texas. Bertin is a lifelong Texan and resides in Austin. Austin, TX, March 11, 2015 – The advanced energy industry is a powerful economic driver in Texas, with an estimated $16 billion in 2014 revenue, according to the first comprehensive analysis of the advanced energy market in the state. Representing 8 percent of the total U.S. market for advanced energy technologies and products, Texas advanced energy revenue of $16 billion would be enough to buy the Dallas Cowboys, the NFL’s most valuable franchise, five times over. The report, Advanced Energy in Texas, is available for download at texasadvancedenergy.org. Advanced Energy in Texas was commissioned by the Texas Advanced Energy Business Alliance (TAEBA), a new group on the Texas scene. TAEBA is made up of local and national advanced energy companies doing business in Texas and helping the Lone Star State meet its energy challenges. A complete list of companies participating in TAEBA is available at texasadvancedenergy.org. Though well known as the center of the traditional oil and gas industry, Texas is also home to a growing advanced energy industry in areas such as wind and solar energy, natural gas electricity generation, and energy efficiency measures that save money for building owners and manufacturers. The report gives much of the credit for advanced energy growth in Texas to the state’s pro-business, pro-growth spirit combined with deliberate policy structures, including renewable energy and energy efficiency standards, as well as the nation’s most open and competitive market for energy resources, managed by the Electric Reliability Council of Texas (ERCOT). Advanced energy is defined as a broad category of technologies and products, and it is made up of seven major segments. In Texas, building efficiency is the largest segment, with $5.4 billion in revenue in 2014. Products and services such as building efficiency improvements, efficient lighting, high efficiency HVAC equipment, and demand response are significant contributors to this segment of the industry. The second largest segment, at $3.6 billion in 2014, is made up of advanced electricity generation technologies such as wind, solar, and natural gas. Electricity Generation: With $3.6 billion in revenue, electricity generation (such as wind, natural gas, solar, geothermal, biomass, etc.) is the second leading advanced energy segment in the state. Fuel Production: Advanced fuels, including compressed and liquefied natural gas for vehicles, make up Texas’s third largest advanced energy segment, with $2.7B in revenue. Natural gas vehicles, hybrid vehicles, and the fueling infrastructure that supports them contributed to $2.3 billion in advanced Transportation revenue in Texas. Wind: Texas has more than 14 GW of wind power – twice the capacity of California – with an additional 10 GW of wind in the pipeline. Natural Gas: With nearly 70 GW of capacity currently, Texas natural gas power generation is projected to fulfill over 4.5 GW of growth over the next two to three years. Energy Storage: With potential to end a range of electricity system problems and inefficiencies – fluctuating demand, idle capacity, variable resources, minute-to-minute frequency control – and steep cost reductions anticipated, energy storage is now within reach. “Solar is taking off in Texas,” said Jim Hughes, CEO of First Solar, a global provider of photovoltaic solar energy solutions. “Our Barilla Solar project is the first solar power plant in the country to offer electricity on an open contract basis, and it illustrates how solar has become a reliable, competitively priced component in the state’s balanced energy portfolio. We see an enormous growth opportunity for solar in Texas.” Along with the Barilla power plant, First Solar has several other projects in various stages of development in Texas. The Texas Advanced Energy Business Alliance includes local and national advanced energy companies seeking to make Texas’s energy system more secure, clean, reliable and affordable. TAEBA’s mission is to raise awareness among policymakers and the general public about the opportunity offered by all forms of advanced energy for cost savings, electric system reliability and resiliency, and economic growth in the state of Texas. For more information, visit texasadvancedenergy.org. Navigant Research, a part of Navigant Consulting’s Energy Practice, is a market research and advisory group that provides in-depth analysis of global clean technology markets with a specific focus on the commercialization and market growth opportunities for emerging energy technologies. Navigant is focused across four research programs: Energy Technologies, Utility Transformations, Transportation Efficiencies, and Building Innovations. For more information, visit navigantresearch.com. Another witness who spoke against the SFV rate mechanism was Suzanne Bertin, executive director of the Texas Advanced Energy Business Alliance, a group of companies involved in energy efficiency, energy storage, demand response, distributed energy resources, natural gas generation, biofuels, nuclear power and smart grid sectors. "Straight fixed-variable can allow utilities to recover costs either through fixed monthly charges or peak demand charges, and a major down side of substantially increasing those fixed charges is that it creates a disincentive for customers to invest in distributed energy resources by taking away their opportunity to make their personal decisions about how and when to consume energy," Burton said. "SFV would send the wrong price signal to customers by reducing the incentive to manage their own bills and reduce their own usage." The Lone Star State is the center of the nation’s oil and gas industry, but the solar, wind and energy-efficiency sectors appear to be on track to one day eclipse the fossil-fuel industry. It’s no secret that low commodity prices have resulted in thousands of layoffs across the oil and gas industry, which at last count employed around 245,000 people in Texas. 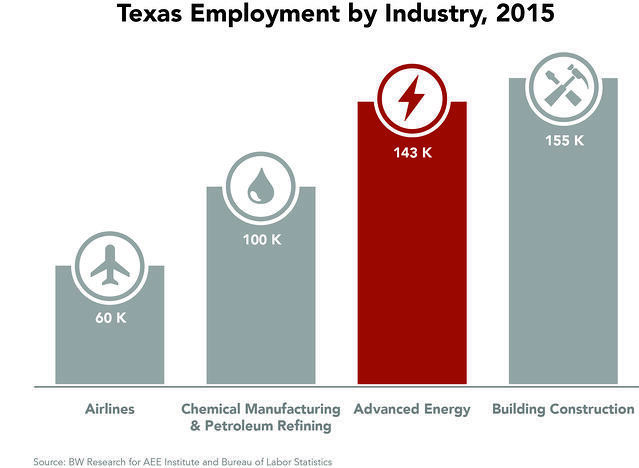 But a new report from the Texas Advanced Energy Business Alliance shows that “advanced energy” jobs have grown to the point where they now employ more people than refining and chemical manufacturing in the Lone Star State. The report, formally released today by the Texas Advanced Energy Business Alliance (TAEBA), tallied around 143,000 positions in advanced energy in the state last year. That easily topped a 100,000 figure from the chemical and refining segment, more than doubled the estimated 60,000 jobs in airlines, and trailed building construction by about 12,000 jobs. And more expansion may be on the way, according to the report prepared by the BW Research Partnership. It highlighted an estimated addition of 9,334 Texas advanced energy jobs by the end of this year to surpass 152,000, marking potential growth of close to 7 percent. "The main takeaway of the report is simply that we are a significant presence in the state of Texas and we're growing," Suzanne Bertin, TAEBA's executive director, said in an interview. TAEBA said her experiences have touched on issues related to demand response, energy efficiency, natural gas, renewable energy, electric vehicles and smart grids.